The development of algae farms to remove carbon dioxide from the flue stacks of coal fired power plants is a real prospect in the US, according to speakers at a conference organized by the coal industry. The Louisville Coal-Gen 2008 conference featured speakers explaining how the chemical processes work that turn coal-generated carbon from a hazardous material into a profitable product – biodiesel fuel. That’s good news for the coal industry, which is finding itself increasingly at the center of the global warming debate. Algae plants, if taking off in earnest, would be an alternative to capturing carbon and storing it underground, a method specialists say is among the most viable of effective options to reduce the carbon emissions of coal fired plants. Rural farms could grow algae that thrive on coal plant fumes and soak up carbon dioxide naturally. Experts say that a 100-acre algae farm can produce 4 million gallons of fuel a year. That is a better ratio than other biodiesel crops such as soybeans turn out. 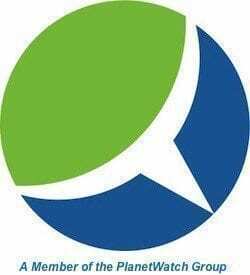 One of the speakers, Robert Healy, an engineering construction consultant at Burns & McDonnellMo., said that algae crops have a future, not only because of their use in the coal burning sector, but also because they can be processed into biodiesel fuels. According to Healy, algae are more attractive than oils for use as biodiesel fuel. Another added bonus is that the leftover material can be converted to animal feed or other products. Instead of going to the expense of underground storage of carbon dioxide captured from coal fired plants, turning the waste into a marketable product is very feasible, Healy told the conference’s attendees, which numbered around 4,000 people. But he warned that algae are not 100% efficient as a means to scrub power plants’ carbon emissions. 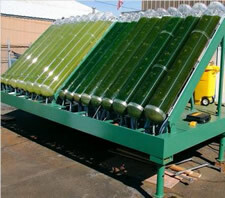 Two companies that are already testing the method are NRG Energy, the Princeton N.J., and GreenFuel Technologies, who are using algae to recycle power plant CO2 emissions safely and economically into a continuous supply of clean, renewable fuels at a 1,489-net-megawatt, coal-fueled power plant in New Roads, Louisiana. E.On, the German power company, is also testing the method at Louisville Gas and Electric Co. and Kentucky Utilities Co., two of its operations. Further evidence that the algae solution is promising is the massive project the U.S. government started under Jimmy Carter in 1978. The Aquatic Species Program of the Department of Energy was only closed down in 1996 because the researchers involved concluded that it did not turn out to be cost competitive with petroleum. Yet the oil price now is three times as high as during the time that the project was aborted. Really great work your doing with this blog.Keep it up!!! I came from ceramics industry and i want to know the Process of reducing Co2 using algae. This idea makes absolutely no sense except to the coal industry. To replace the sequestration of CO2 emissions from burning coal, the algae would have to remain isolated from the biosphere for the next 100 million years or so. Burning algae products to generate energy releases the CO2 back into the atmosphere. If the algae can really keep up with the coal industry’s emissions, then there is absolutely no reason whatsoever to mine coal and burn it. Simply grow algae to power the world economy. Even then, biodiesel is the wrong product to make from the algae. We can’t afford the new investment. Botryococcus braunii is a pelagic algae that grows in the Indian Ocean. Its various strains make isoprene oligomers with different average molecular weights, mostly centered around n=6. What matters most is that the dry weight of the most prolific strain is OVER 70% HYDROCARBON. This is algae truly is a fuel plant. Oil companies could feed these hydrocarbons directly into existing refineries. Electricity generators could directly replace coal with them. Because the hydrocarbons contain no sulfur, nitrogen, metals or ash, most existing pollution abatement and catalyst guard investment could be shut down as unnecessary. This is a really sweet feedstock.